Cartoons of interest in any of the categories are available for licensing in any type of professional or commercial projects and black and white cartoons can also be colorized based on your instructions. Cartoon gags can also be edited and tailored to your group or association and relate to a certain issue or topic. Dan has also created magazine covers for specific association trade journals and for publishers who create monthly or bimonthly publications. Editorial directors can easily provide details as to the type of idea or concept they have in mind and rough sketches are created and provided for review. If the editor likes the overall design and look, the artwork is given a finished inking or changes can be made prior to sending the digital file in the required format and the size of the cover’s layout. Dan will also create custom cartoons for calendars which are ideal for promoting your company or group and a cartoon for each month of the year could revolve around your association or specific people in your company. The content could also be combined with any holiday that occurs during that month. Cartoons are also created for use on t-shirts that can be sold at benefits and other functions in which your group or association will be able to profit from. Additionally, existing cartoons found in this web catalog can also be licensed and even customized by having color added and gag lines to any cartoon changed to your requirements. Cartoons on apparel will attract attention! 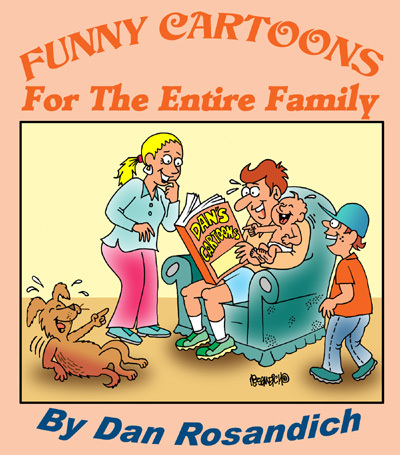 There are many options that exist in relation to the cartoons found throughout the various catalogs here at DansCartoons and flexibility should be kept in mind when you are considering work for various uses. If there happens to be more than one, two or even 10 cartoons that you are considering for a project, simply advise as to what you’re planning and the intended use and include any other pertinent information in the way of color, caption changes etc. Special pricing options can be quoted based on the information you provide. If we need to discuss something at length, provide a number where you can be reached and the call will be returned immediately….